"Papa..." I can hear Martha's soft, insisting voice over the hushed bonhomie of men, many of them long gone to their graves. 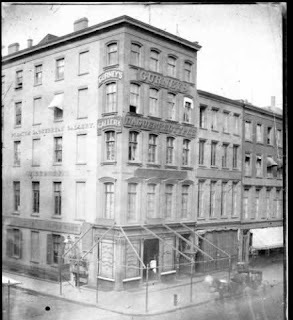 I'm dreaming again, I know but I'm reluctant to leave this evening's celebration at the old studio on the corner of Broadway and Leonard and return to the home of my daughter, at the turn of the century in Coxsackie, New York. "To our modern Prometheus!" It's Anthony's voice, I hear. As certain and clear as if he was sitting in a chair beside me, lazing in the warmth of the early spring afternoon in my daugther's sun porch. My dear friend and merchant, Edward Anthony. He's smiling across 40 years, across a candleabra festooned dining table and raising a glass of Verdelho to me! "Gurney and Daguerre, you have stolen fire from the sun! And rekindled fond affections flame." Their voices resound in muffled, admiration and agreement. Their crystal glassware twinkle with the glow and reflection of the room's oil lamps and candlelight. Their smiles and shining faces, made red with a sumptuous meal and good cheer. The oaky smell of wine and cigar hanging about the room. They are all there, these...these ghosts. The men whom I call my dearest of friends. The ones who began it all with me. There would come time for bitterness and envy and treachery, of course. Are we not men??? Are we not mortal? But tonite, in this long completed evening of December 21, 1853, we are the dearest of friends. And I have the honor of their kind words and the humility of being their servant and host. Professor Renwick offers a subdued opening speech and Mr. Bidwell, entertains us with a recounting of friend Edward Anthony's generous and inspiring idea which brought us all here! A challenge! A gentleman's participation in the discernment of what we are all endeavouring to raise up from it's infancy! As the esteemed Mr. Anthony himself would display in asking Mr. Bidwell to speak on his behalf, modesty compelled us to pass on such an offer in years past. With time and thought given rightly to posterity, it became evident that such a task to offer up the very best was a just, noble and solemn right. The massive silver pitcher sits at the very center of the circular banquet table. Near to it, two silver goblets for runners up. Daguerre's face, etched into one side of the pitcher. His eyes looking on quizzically. The candlelight gives him a warm tone. It's my friend Wallace's voice, of the Mercantile Guide. I've asked him to say a few words on my behalf. I am feeling the most aghast at any further attention being directed to me and a sincere wish for this aspect of the evening to be completed. To be thought of as more for what I am. A partner in the evening's celebration for the industry we are all helping to build. 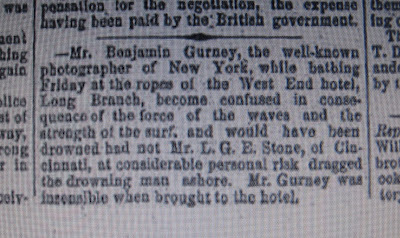 "Mr. Gurney entertains the most grateful feelings of all parties. He presents his thanks for their kindness on this occasion..."
Letters are read from those who could not attend. Professors Morse and Draper send their congratulations and regret at not being with us. Samuel Dwight Humphrey, our nascent industry's editor and publisher rises to address the assembled with a remembrance of Daguerre. "My good friends! Tonite you have honored me not with your words, though they are so gratefully and thankfully received but with your presence. To look across this room and see so many who have contributed so earnestly, so devoutly to our mutual concern, truly fills my heart with admiration and happiness. 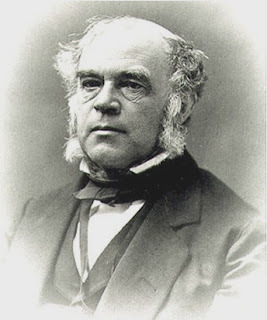 My only wish is that those who could not be here, Professors Morse and Draper who participated in the evaluation of all our entries and Mr. Brady, who has and no doubt will continue to lead us in the years to come, will, if God so desires be with us all next year when we shall convene once again!" My modest attempt to summarize and offer a fitting end to an evening either went unrecognized or unaccepted for the good fellowship went on well into the following morning. More off color stories about the Irish (Mr. Roach having left acrimoniously by this time) and more wine and tobacco. Candles were extinguished and further subdued and the cast drew smaller and quieter. More sincere. And then it was left to dear old Snelling, Henry Hunt Snelling. As fine a writer, photographer and friend as ever there was, to suggest to those left assembled that "unity of purpose be daguerreotyped upon our hearts and indelibly fixed by those golden attributes; friendship, charity and harmony." "Papa..." Martha's loving smile is before me, her hand soft on my shoulder. I awake with a yawn, the sun's rays casting long shadows across our yard. "Mattie, my dear, how long have I been asleep?" I ask. "Only a short while, papa. I'm fixing a late lunch for us." 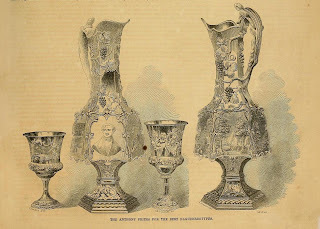 She kisses my forehead before walking out of the porch and back into the house, towards the kitchen and I'm left to think of her mother's reaction to that beautiful silver pitcher when I returned home to our house on Henry street in Brooklyn, in the early morning hours of December 22nd, 1853. "Oh, Jeremiah! What use does this family have for such vainglory!" I pause for a moment before carefully rising out of the warm chair, my bones aching with age that only moments earlier were those of a young man's. As I slowly walk to the voice of my daughter, humming an old hymnal in our little dining room, I wonder for the first time, what indeed did Phebe do with that beautiful silver pitcher. My uncle Jacob and I visited Mrs. Henry Dubois several weeks after her husbands untimely death in Little Falls and it was on that very day that I met my dear Phebe. Dressed in mourning as was the woman she so tenderly called her "Mama" and administering to the still reeling Mrs. Dubois as only a devoted daughter could, I found it difficult at best to concentrate on the reason for my and my uncle's calling and not upon heaven's angel that sat close to her mother that day. In turns feeling the uncomfortability of being in the presence of a family grieving for the loss of a man who was so admired and genuinely loved and desperate to compose my own thoughts to the matter of our visit and lessen my more instinctual curiosity regarding the young Miss Dubois, I relied heavily on Uncle Jacob to steer the afternoon's conversation accordingly. As I was to learn that day, My uncle and Mr. Dubois had been more than mere mutual business acquaintances. They had a profound respect for each other. 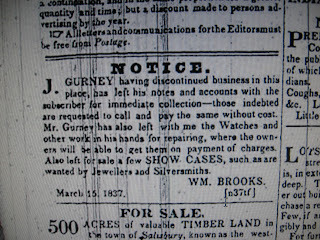 While very little personal correspondence had in fact taken place, they nonetheless knew of each other's work very well and had occasion to offer entre and recommendation to client's who, when in need of service that either party could not provide, would happily suggest the establishment in New Baltimore or Little Falls, whichever the instance might be. Tea was served and our visit passed as pleasantly as circumstances could possibly provide. Indeed, for there came a point when gentle, careful considerations were established and both parties were in agreement that I would seek room and board within the community and assume management of the late and venerable Mr. Dubois' place of business. While no transfer of title was completed that day or for several years afterward for that matter, our meeting in the parlor of the widow's home was significant and providential on so many levels, the least of which being business associated. As I listened to Uncle Jacob and Mrs. Henry Dubois lament the passing of her good husband while formulating a plan to address the business' resumption of operations, I found myself stealing moments of observation with quiet consideration, the adroit pose and movements of her daughter, Phebe Ann. While being entirely chaste, I am and have always considered myself to be a gentleman of advanced perception. I say that not in any effort at self flattery but rather, in previous occurence. I have often experienced a sense for something as it was happening, that led me to believe or feel as if there was impending significance attached to it. I recall meeting Phebe with just this perception. She was a handsome young woman, that there was no arguing. Her dark hair and blue eyes reminded me of my sister Catherine. Dressed entirely in black, her veiled head bowed more often than not in quiet contemplation of her prayerful hands, she sat very near to her mother. A buttress of support. If she said a word during our first meeting, I really don't recollect. 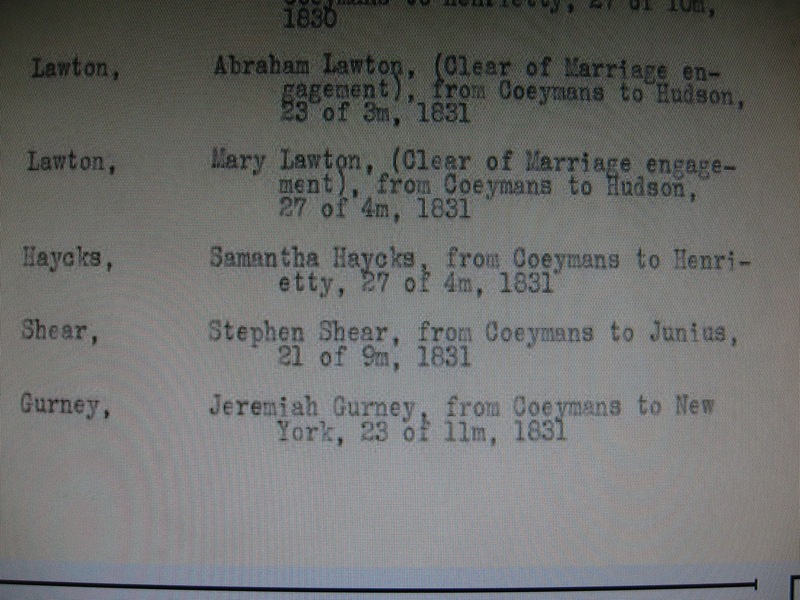 I myself said very little, deferring to those of Uncle Jacob and Mrs. Dubois. Our eyes did meet that day, though, that I do remember. I carry that moment around with me as so many would come to carry images of their loved ones in tiny leather casings or silver lockets that I would one day create for them. Phebe would tell me many years later that in my eyes she saw goodness and light. In hers, I saw kindness and comfort. She was grace and beauty and I love her today as I did on the day I married her. I miss her. The years we spent in Little Falls managing our family's jewelry establishment and looking after her mother and older sister Charlotte were as happy as any we were to have in our lifetime together. As today, there were carriage rides and harvest festivals. Visting dignataries providing oratorical debates to entertain. Still, the quiet, country life as was our thriving upstate village would one day be supplanted by my seemingly unbounded curiosity and longing for more. 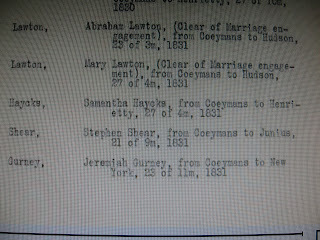 in 1942-1843 Doggett's NYC Directory. 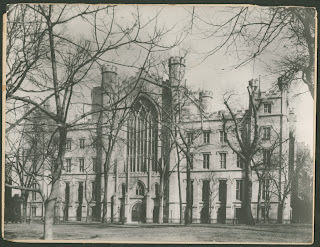 The very next morning as I recall, upon my initial meeting with Professors Morse and Draper, I paid a visit on Mr. John Roach's establishment around the corner from my own, on Nassau street. 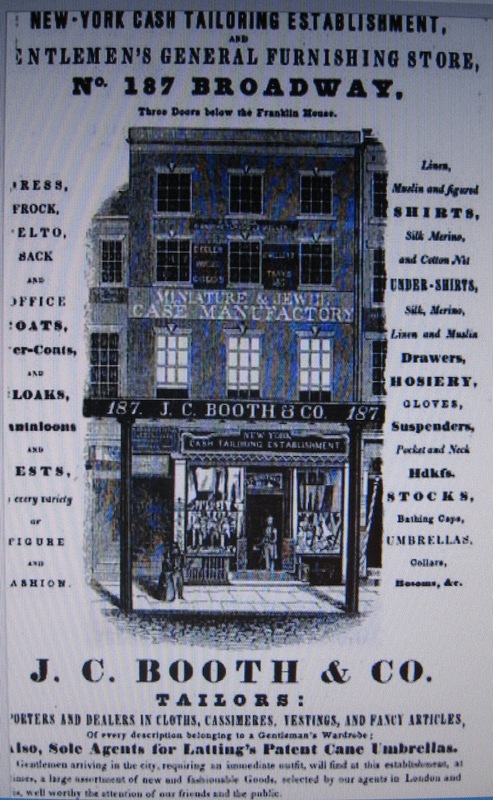 John Roach was a brilliant Irishman who worked in the manufacture of glass instruments for scientific purposes. 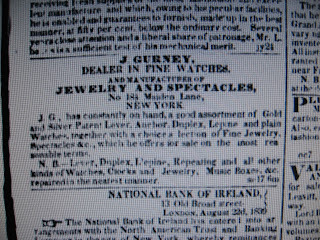 While Morse did refer him, I had already a business relationship with Mr. Roach due to my own work with spectacles and watch repair. I was immediately met with a warm and welcoming hello as only the Irish can provide in their own inimitable way. "Well if it isn't Mr. Gurney! Has another one of your customers need for a stronger pair of corrective lenses then? Or perhaps the crystal on one of their Lepine's has cracked?" I smiled good naturedly at him "no, Mr. Roach. Today I am visiting you on an altogether new venture. 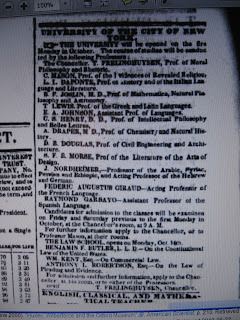 I have just come from a meeting at Professor Morse's rooms at the University." It seemed apparent that I had to offer no further explanation. "Ahha! He has you in his grasp as well then, eh?" A wide smile erupting over his taut celtic face. His eyes sparkled with a wink. "Well, Jeremiah. Your timing is as accurate as those fancy repeaters you have such an ability to set in motion. Those wealthy patrons of yours should thank their Holy Father for I'm certain if it weren't for you many would still be reliant on the sun's position in the sky to keep them aware of their day's schedule!" He continued, "I am only now just finishing off a set of tools for the manufacture of Daguerre's sun portraits for a neighbor of ours, Mr. Johnson". Mr. John Johnson was an acquaintance of mine. 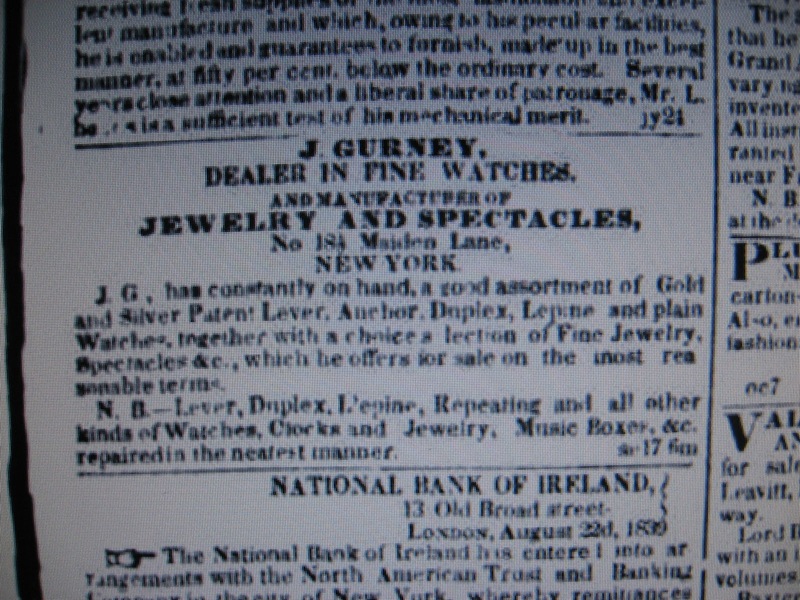 A very good, if a bit harried, man who also operated in watch and jewelry repair. 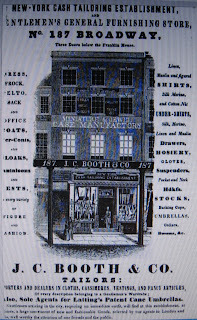 "He was here no more than an hour ago, impatient with my work so I sent him off with a cheery good day and a suggestion to visit my friend Mr. Wolcott who might be amenable to expediting matters for him." Roach paused for a moment, looking down at the glass enclosed wooden display case that stood between the two of us. A young man at the time, like all of us, but also a man who seemed prematurely aged. He too had a family to provide for. The current financial circumstances of our country was hardly comforting to most and to those who were new to our land, those who had recently emmigrated from their native soil, it was even worse. He looked up from his quiet consideration and met my eyes, "you know Jeremiah, I really don't know if I'm made for this country of yours. I am quite pleased with it's industry and inquisitiveness, it's appeal for growth and technology. 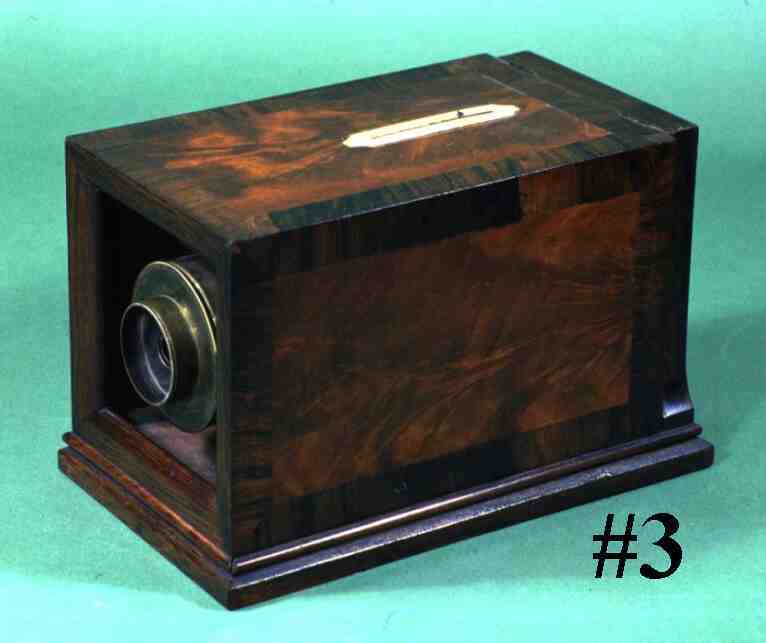 But," and as he finished his sentence he turned and produced from under his counter a similar camera obscura to that which I had seen at Morse's atelier only yesterday, "when a man cannot find the time for another man to complete the project he was indentured to do on his behalf." His voice trailed off as he placed the box on the counter. I watched as Roach produced the brass cylinder that stared at Miss Draper so insolently and with considerate hands, gently but firmly placed the tube into the round opening. Affixing it with hide glue he stood back and smiled. "There," he said, "now we have finished." I've just awoke from the nightmare I've had so many times in the past. That man from Cincinnati, Mr. Stone, isn't able to drag Ben in from the ocean. He reaches for my son and at the last moment, comes up without him. Ben is washed out to sea, choking and screaming out, pleading for someone to help him. I come to, unable to formulate his name, my mouth contorted, frozen in fear. I recall thinking, when news of his near drowning reached me, that his situation had at last, gotten away from him. The moment had finally come where his intemperance had gotten the better of him. Maybe this was the very thing he needed to have happen in order for him to come around. To see things as they were and address matters. It wasn't until many years passed, until the last ties between us were severed, that my son's misfortune that day at the beach were realized to having hadn't been an accident at all. Jeremiah Gurney, American (1812-1886). 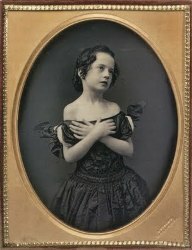 Young Girl with Arms Crossed, ca. 1852-1858. 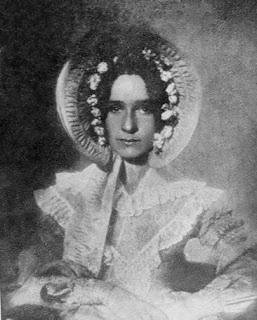 Daguerreotype. The Nelson-Atkins Museum of Art. Gift of the Hall Family Foundation, 2006.44.11. My daughter Martha enters the room in her quiet, kind manner. She's carrying a tray of tea and breakfast breads along with a loving smile and gentle admonishment of "Papa, you know you shouldn't be writing without the reading light on at this hour of the morning." I turn my gaze to her and my mind's eye transforms her from the middle aged widow standing before me into the 13 year old girl who posed for the first prize winning photograph ever taken in this or any other country. "My dear, your father's eyes are as clear and focused as they were forty some odd years ago when I handed you Mr. Anthony's silver pitcher." She smiles and places the tray on the table, handing me a cup of tea and inquiring into what I am writing on this chilly first day of April. A birthday letter, she hopes, to her brother Ben? The smile stays fixed upon my face for I dare not dash Mattie's longing for a reconciliation between myself and my only son. But underneath it, the thought of how things went so terribly wrong with him and myself, how so much love and success could be replaced with such an abyss, fills my heart with despair. And so it came to be, that on a warm, sun drenched October morning in '39, the little silver bell that hung on the door of my jewelry shop announced a visitor who would change my life from that moment on. In hindsight, I had of course already heard of him though I can't recall ever having seen his portrait nor an engraving. 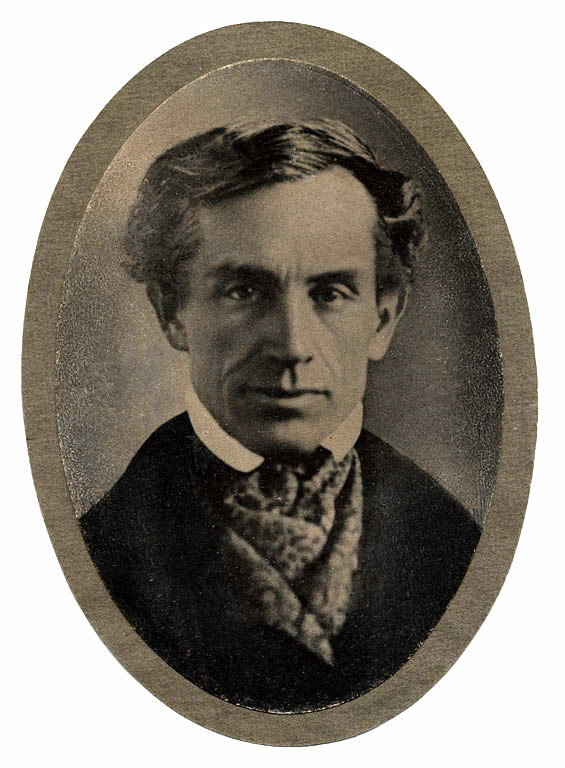 Professor Samuel Finley Breese Morse was, at that point in time, one of the most famous men in New York City if not the world and in reading of him and his developments in our newspapers, I had come to admire his constant, inquisitive nature. An artist, historian and teacher at the University of the City of New York by profession, Morse had recently made headlines with the announcement of a new means of electrical long distance communication he called the Telegraph. The promise of such a means of sending and receiving messages instantly from say, New York to New Jersey or even, dare we dream, New York to Washington City, gave many a learned individual pause to consider, what could man possibly come up with next! 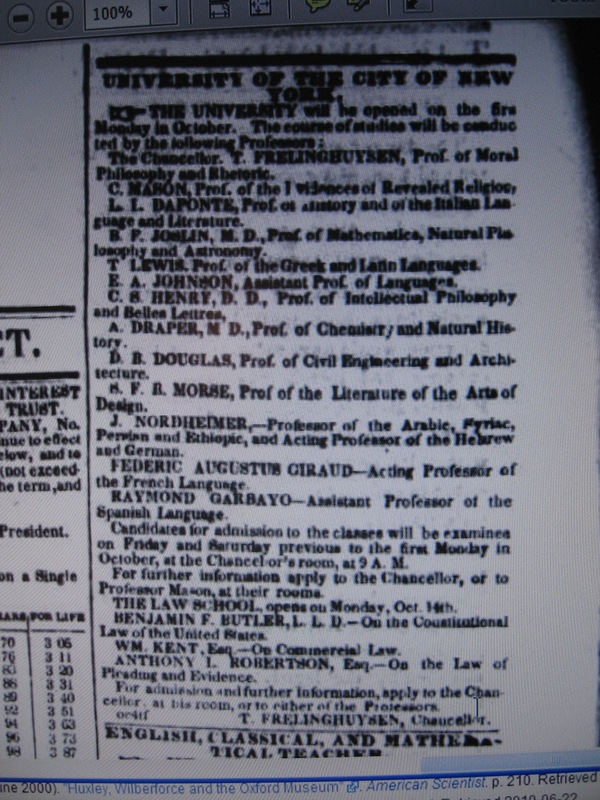 Introductions were established and it was at this point that Professor Morse made clear the reason for his visit. 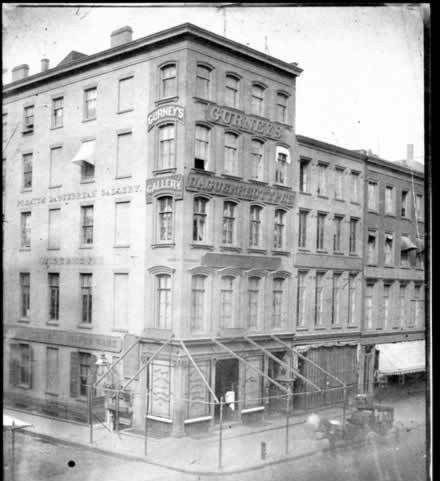 "Mr. Gurney, I am today visiting your fine establishment as well as the other jewelry shops here on Maiden Lane with news from Paris of a new method of portraiture by means of science and sunlight rather than brush and oils." It was then that I recalled reading earlier in the year of M. Daguerre's successes with such a process. I listened with no small level of interest as he began to relate his story, for the idea had fascinated me ever since I first read of such a process. "I had been invited by Daguerre himself. To visit with him on my trip to his country from whence I announced to the continent my own success with electrical telegraphy. An exchange of ideas and practices were discussed and frankly, I found him to be a very humble and open individual. It appears that both he and a fellow countryman of his, a Monsieur Niepce have been working parallel to one another on putting theory to function and, while Niepce has since passed, both Daguerre and an Englishman named Talbot have arrived at the finish line more or less at the same instant." 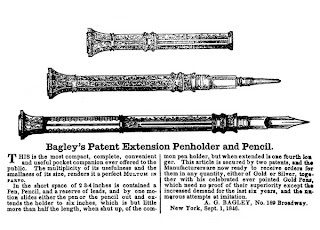 "While Daguerre has been awarded pensions from their government for his country's participation in international scientific advancements, Mr. Talbot on the other hand is hard at work on a patent for his process. Which leads me back to my own situation. 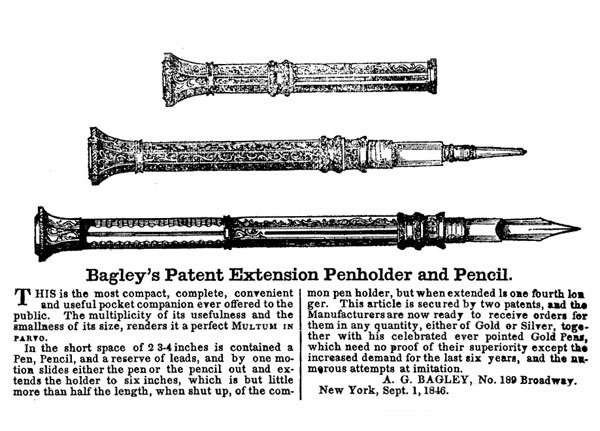 If procurring a patent is as difficult for the englishman as it has been for me and my invention, Mr. Talbot will have to find an interim means of providing for himself and his family, should he have one." "You see, Mr. Gurney, while I do have a mind for how things work, I am above all an artist. Professors are the recipients of a glorified title, little else. The scientific aspect of my private interests in telegraphy have been subsidized solely on fees collected by way of my students directly. I receive no salary. To make matters more difficult, I have been advised by more than one government employee, the process of applying to the United States Patent Office requires time and patience. Money seems to be the one ingredient they always seem to overlook mentioning, however." My thoughts turned to my own situation. I was 27 years old. Already the father of a three year old son, Ben. My wife Phebe , pregnant with our daughter Martha, was due any day. Additionally, I had others to think of. Phebe's mother, Lavinia and sister, Charlotte were also members of our household. I knew first hand how difficult times were. 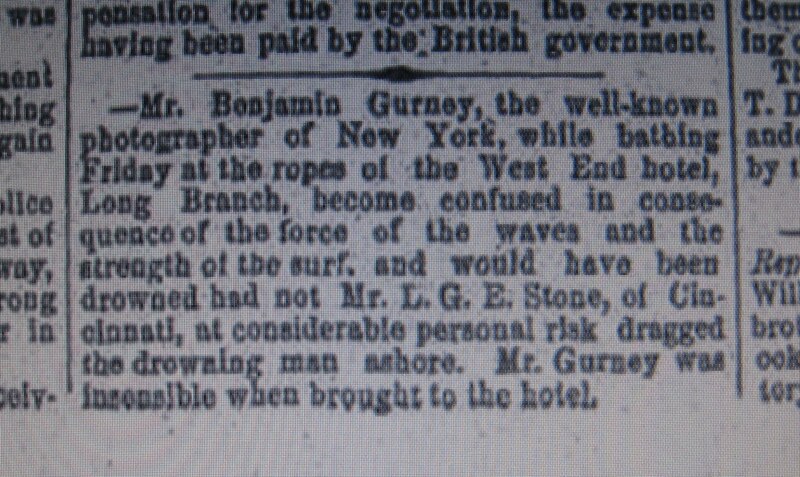 Morse continued, "We live in hard times, Mr. Gurney. Our country is suffering at the moment. Growing pains is how our leaders and newspapermen describe it perhaps but pains nonetheless. To survive and provide for ones family, a man needs to use every available means he has to bring money into his posession. That is why I'm here in front of you today." 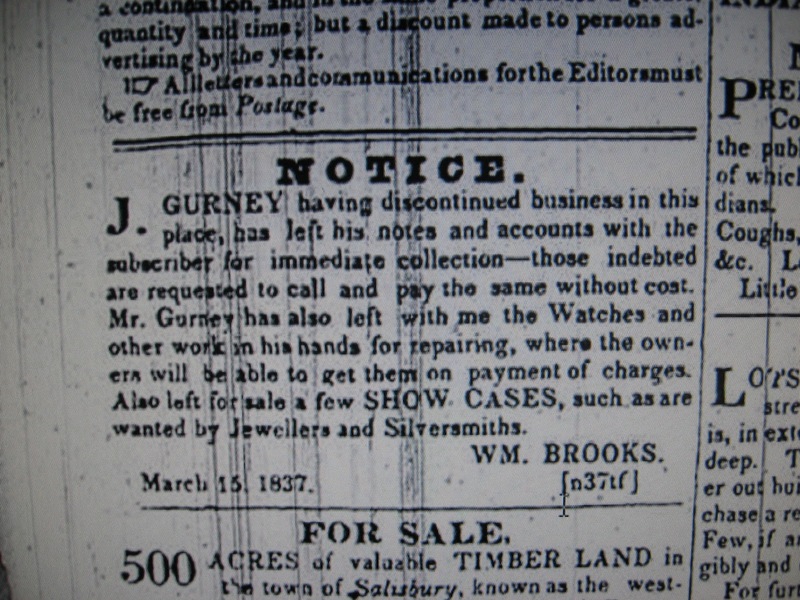 "Mr. Gurney" Morse continued, "I bring you an opportunity to add to your shop's services offered and thereby add money to your register. 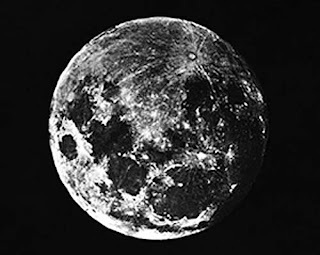 Upon our conversation's close, M. Daguerre handed me instructions on how to produce his sun portraits or as he calls them, daguerreotypes. He wanted no compensation other than the recognition of his contribution by way of the term, daguerreotype. Over the past few months, I along with a colleague, a fellow professor who happens to be a chemical engineer by the name of Draper have been experimenting with Daguerre's instructions and enhancing them for commercial purposes. We believe we're at a point where almost anyone with a modest degree of intelligence can produce an individuals resemblance rather successfully." 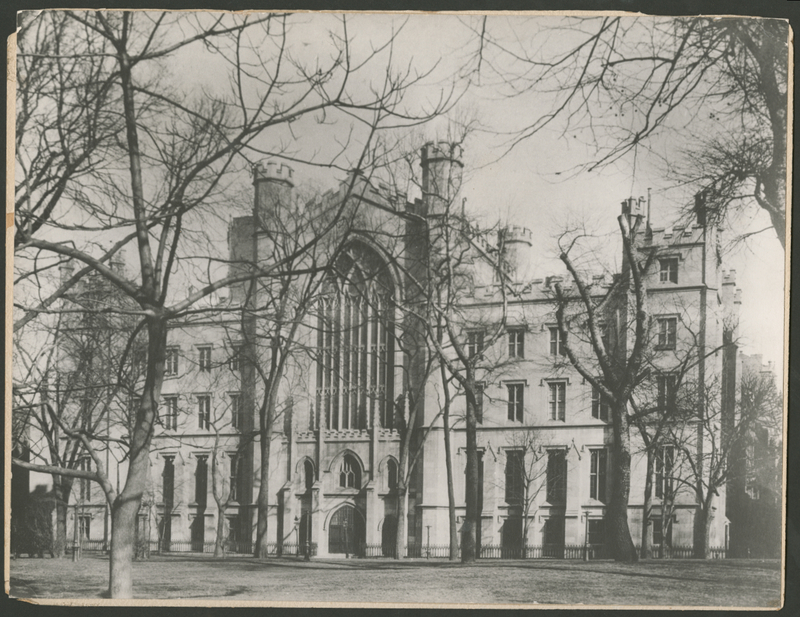 "The process does involve a certain amount of aptitude with regard to the use and combining of certain chemicals but they are readily procurable by way of my affiliation with the University." He offered a quiet smile as if to infer that this aspect of the process may be better left unmentioned. 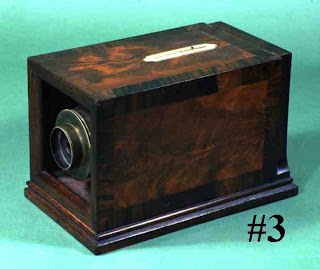 "What you will have to allow for is the initial outlay to build the camera obscura, as it is called, and the apparatus and holding containers for the development and fixing of the portraits. And there is of course my fee." "Twenty-five dollars. Payable upon our first instruction. If this is agreeable to you, I should like to invite you to my atelier where you may view several specimens that Mr. Draper and I have produced to date. Upon your inspection, if you find this pursuable, you may pay me and tutoring will begin." Morse's attention then turned to our surroundings, as if he were mentally sizing up my little shop up for other purposes. The sun's rays drenching us with warm light thru the large store-front windows. Turning his palms over and opening them, he sighed contentedly as a prism of color from a glass ornament hanging near my windows danced in his hand. It was then that I asked what had been on my mind since the moment he began his business proposal. "Mr. Morse, why are you coming to me with this opportunity?" "Because Mr. Gurney," he replied "your customers have two crucial things to spend, time and money. And because," casting his gaze and directing my attention back upon the refraction taking place within his grasp, he gently closed his fingers as if on the very rays of sunlight in his palm, and pronounced, "you sir, have this!"